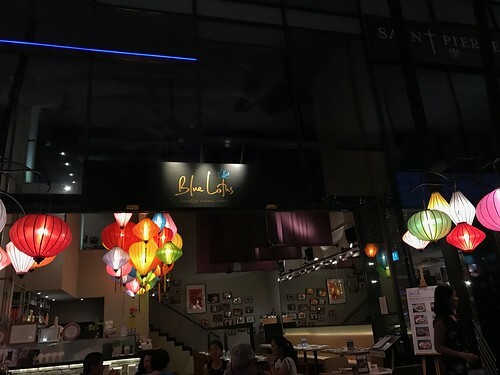 Named after a famous Tintin comic, Blue Lotus is the only Chinese restaurant in the Sentosa Cove waterfront dining enclave. 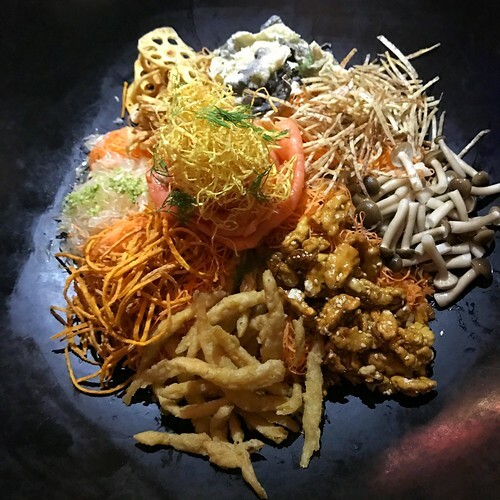 Renowned for its contemporary interpretation of Chinese cuisine, expect the unexpected at Blue Lotus. From now till 11 February 2017, Blue Lotus is offering three Chinese New Year set menus to usher in the Year of the Fire Rooster. 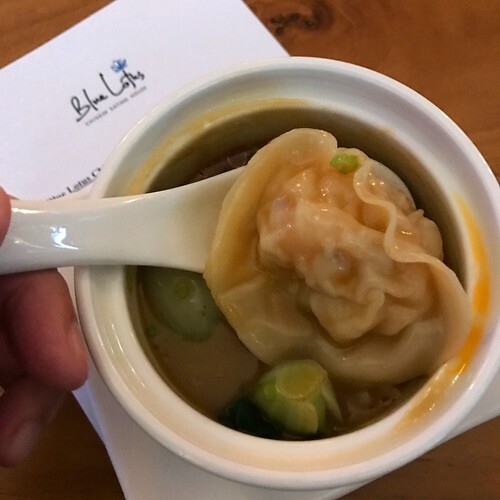 Here's my review of some of the menu highlights that I tried during a recent media tasting. Blue Lotus' Signature Tea-smoked Norwegian Salmon Yu Sheng is a healthy version that is made with 20 fresh ingredients. Named 十全十美(Shi Quan Shi Mei), which means "perfect" in Chinese, it consists of 10 herbs and vegetables, Tea-smoked Norwegian salmon, salmon skin, silver bait, two aromatic spices, three types of nuts, spring onion-infused olive oil and wild honey yuzu dressing. Available for dine-in and takeaway, Blue Lotus' Signature Tea-smoked Norwegian Salmon Yu Sheng is priced at $68++ for a small portion and $88++ for a large portion. One of my favourite dishes that evening was the Truffle Wonton Lobster Bisque. 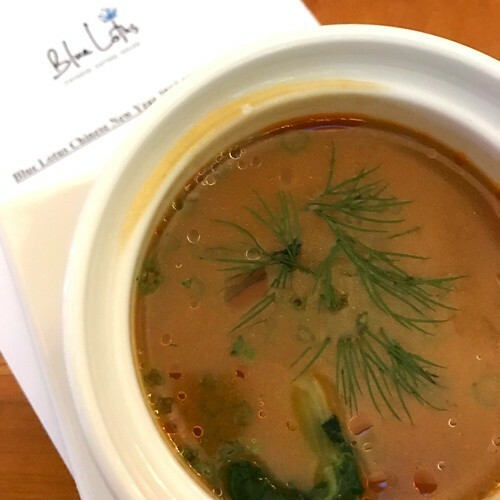 I enjoyed the lighter version of lobster bisque that was garnished with fennel for a fresh fragrance. The ingot-shaped wanton was packed with crunchy fresh prawns. Though the wanton skin was thin, it wasn't too soggy and still retained a bite. This is a Must-Try! 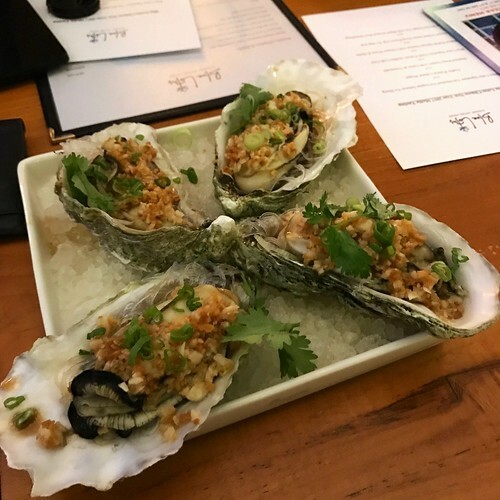 I like to eat my oysters raw and without any condiments however this Steamed King Oysters with Garlic & Shallots dish was so flavourful, it changed my mind about cooked oysters. The mung bean vermicelli had absorbed the rich flavours of the jus and was a pleasure to slurp on. 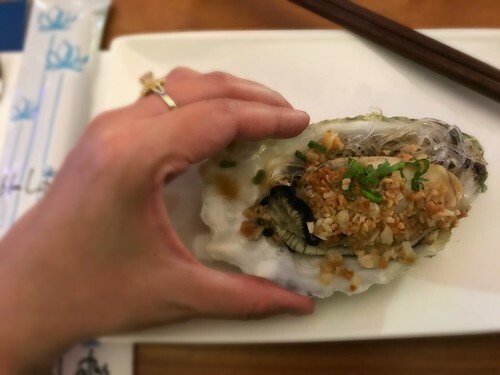 Isn't it cool how each oyster was about as big as a hand? I don't like Chili Crab because of the starchy gravy that's usually too sweet and has too much ketchup for my taste. 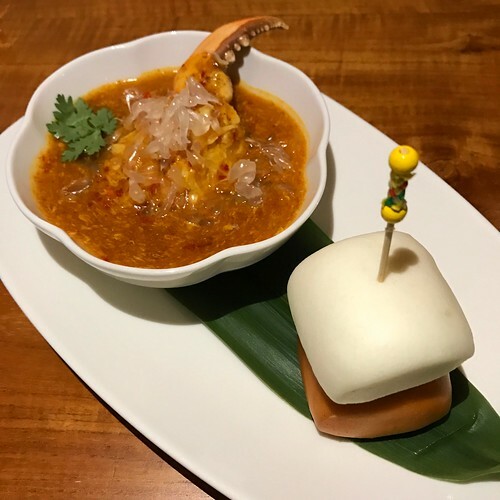 The Signature Chili Pomelo Stuffed Crab Claw changed my mind. I enjoyed the spicy sauce that was not filled with ketchup and not too sweet. The crab claw was bulked up with crab meat from other parts of the crab making for a hearty fix so I can see why this is a very popular dish here. 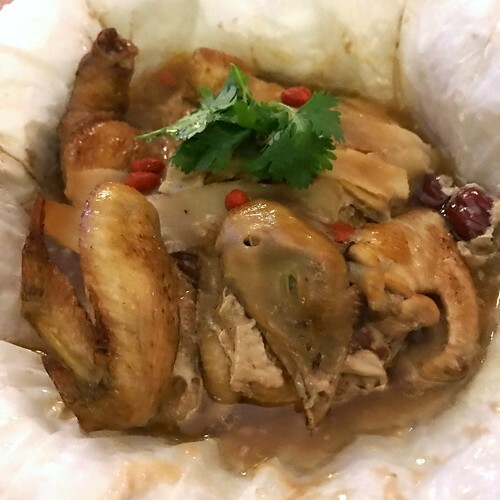 The Salt Baked Herbal Spring Chicken with Chinese Wine & Herbs was so tender, the flesh was falling off the bone and the chicken could be cut into several pieces without too much effort. Definitely worth a try. 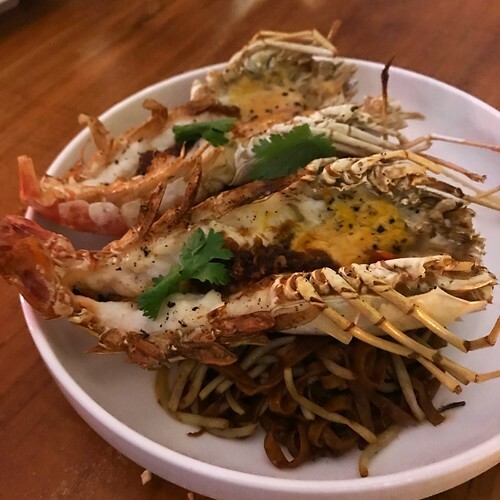 The Josper-grilled Jumbo King Prawn with XO Mee Pok was an umami bomb! The XO Mee Pok was very flavourful due to the dried prawns used in the XO sauce unfortunately, the prawn was dry. 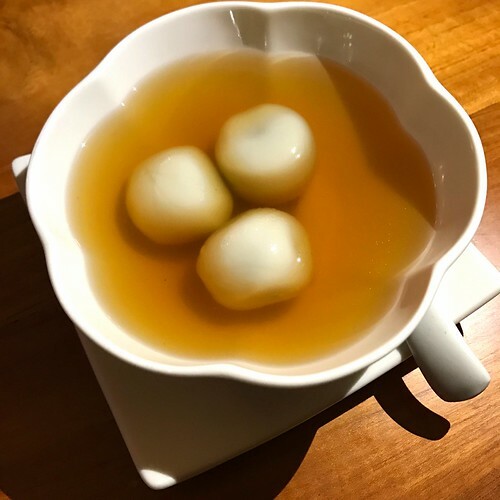 The Double Boiled Ginger Tea with Black Sesame Rice Dumplings was a perfect ending to the meal on a cool evening. The housemade ginger tea wasn't too sweet and was comforting on the tummy as well as my sinuses. Blue Lotus serves a succulent Roast Ibérico Suckling Pig ($238++ for up to 8 diners) with housemade mustard and citrus spicy sauce. A discounted price of $198++ each applies to additional suckling pig orders. Diners need to place their orders at least three days in advance. If you're planning a party for 20 diners and above and opting for the Prosperity menu at $88++ per head, you will receive one complimentary Ibérico Suckling Pig. Blue Lotus will open for lunch on 28 and 29 January 2017 if there is a booking of minimum 20 people for the Prosperity menu or a minimum spend of $2,500. PS: Thank you, Blue Lotus Chinese Eating House and Heat Branding, for hosting me.